Hanover Engineering was retained by Lehigh Valley Industrial Park, Inc. (LVIP) as their site engineer for the design and development of a 188-acre light industrial and office business park. The park is located in Bethlehem Township between William Penn Highway and Freemansburg Avenue, and adjacent to PA Route 33. The park contains 44 lots, four retention basins, and approximately 9,400 linear feet of new roadway. Site utilities, including water, sewer, and stormwater, were designed and constructed to serve the development. Hanover Engineering provided LVIP, Inc. with engineering services for all aspects of the project, including completing the boundary and topographical surveys, preparing the land development plans and highway occupancy permit plans, designing the stormwater management facilities and site utilities, and acquiring all local and state approvals and permits for the completion of the project. Hanover Engineering also prepared the contract documents and assisted LVIP, Inc. in the bidding and award of the project. In addition, Hanover Engineering provided services during the construction of the development, including road and utility stakeout, contract management, and construction observation. 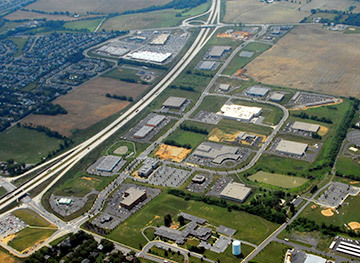 The project involved detailed coordination with PennDOT related to the adjacent PA Route 33 project, which was being designed and constructed at the same time as the industrial park. Coordination was particularly important for the roadway improvements required on William Penn Highway and Freemansburg Avenue.